Asian medicine. In Asian medicine, acne is caused by dampness and heat in the body. To avoid dampness and heat you can avoid dairy, refined sugars, fried foods and processed foods. Detoxification of the liver. Squeeze half a lemon, preferably organic, in a glass of warm water. Drink this upon waking up to cleanse and detoxify the liver. Botanical herbs and supplements can also be beneficial. Hormonal imbalance. A naturopathic doctor can do a lab test to find out if imbalances in the liver are present. Acne treatment takes time. Treating acne takes longer than other issues, especially for patients with severe conditions. Following a healthy diet, detoxifying the liver, and applying topical solutions to acne-caused lesions may be prescribed as well. Phil: So you work with skin issues, acne being is it the most prominent issue you see? Acne is one of the most prominent skin conditions I see. Eczema is another one, but acne I do see quite a bit and actually acne is more common in adult as well, when you’re looking at skin conditions. Phil: Okay, so you see it in teenagers through adults. Phil: And is it treated very differently than eczema or are you again not really treating only the acne or eczema, but treating the person. Tehseen: Ya, so you’re treating the person so it depends on what they’re, sometimes the root cause is the same. There could be a digestive disorder or a hormonal disorder, but it depends on the person, and looking the totality of the symptoms to see where we want to treat. Phil: So what can someone expect if they come in to… actually first I’d ask you, if someone has acne, what are some things they could do at home that can help with that. Tehseen: For sure, so a couple of things, in Asian medicine, acne is believed to come from dampness and heat in the body. So it can be dampness and heat together or separately that could be causing it. So what you can do at home is try to focus on reducing that through the diet. So things that cause dampness and heat in the body are alcohol, refined sugars, processed foods, fried foods, anything that’s basically processed or refined. So trying to avoid these in the diet is gonna help reduce the heat and dampness in the body which can help with clearing the system and then therefore clearing the skin. So that’s one of the things that I generally suggest as a starting point. Another thing is lemon water in the morning. So lemon water is excellent because it kickstarts the liver, so it kickstarts our detoxification processes, and a lot of times something, well all skin conditions are an imbalance within, which is why we’re seeing toxin buildup, and then the toxins have to come out somewhere. So they come out in the skin. So lemon water is a gentle, effective way to kickstart the liver and the detoxification process, so what you do is you take half of a lemon, squeeze the juice of half a lemon into 1-2 cups of water and have it on an empty stomach in the morning. Phil: Warm water – does it matter? Tehseen: Ya, so it should be room temperature or warm or boiling water, but room temperature’s fine – you don’t want it to be cold and that will definitely work. Phil: Okay, so people when they come in to see you, what can they expect? 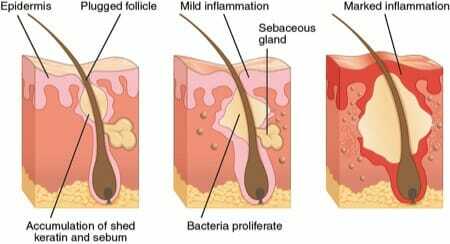 Tehseen: So for me, when I’m treating acne I’m looking at the root cause, so where is it coming from? So it is more of an internal process so for me it’s deciding, putting those pieces of the puzzle together to find out what is it that’s causing acne for this person. Is it hormonal imbalance, is it stress factors, is it a dietary issue, where is it coming from? A lot of times it’s digestion and I see that over and over again where the digestion is weak, so that’s why there’s a more toxic buildup in the body and it’s coming out in the skin. And liver detoxification, so working on detoxing any backup in the liver from all the chemicals that are being used or anything that we’re exposed to on a day to day basis. If the detoxification processes are not working well, that will happen… that will show up in the skin in some way or another. So once I find out what that root cause is, then I’m usually treating through diet and lifestyle changes and botanical herbs. A lot of times naturopathic doctor will prescribe something for acne that’s topical such as similar to what medical doctors do as well, but the goal is always to find out what’s causing the imbalance inside. So sometimes we will have creams or oils that will help with scar reduction and minimizing the acne lesions, as well as changing skin care products that are more beneficial to the skin and more soothing to the skin, but treating from within is where you’re gonna see most benefits. Phil: My understanding with acne is that it can take a little while to… does it take awhile to figure out what the underlying issue is, or does it take awhile once you’ve figured it out just to see the acne receed, or can it be both? I just know that my understanding is that you can definitely help people with it, but it takes more than one session. Tehseen: Ya, so skin conditions will take longer because we do have to treat from the inside out, so they generally take a good couple of months but it’s definitely possible, so you do need a few visits, but once you have those tools in place, you know what to do for the rest of your life in a sense. Phil: Ya, it’s so worth it. Tehseen: Ya, and it’s also knowing that okay if I have a food sensitivity and dairy’s what’s causing acne for me, and you have some dairy and you see the acne come up and you’re like “oh, I know why,” right? rather than “why is this always happening,” right? so it’s also very reassuring to know what the causes are and know and have those tools to work on them so you can reduce it. Phil: It’s so great if you find it’s dairy and you find your acne improves, odds are other things are gonna improve that you weren’t thinking about like digestive issues, or it could be so many things right? Tehseen: Ya, and a big one is self esteem, so I find people come in with acne, whether it’s adolescents or adults, it definitely affects their self esteem, and when that reduces I notice over and over again the confidence that builds up because it’s something that definitely effects mentally/emotionally as well. Phil: Ya, and I was thinking stress, but it’s kind of a similar thing, it’s just like psychologically, it’s such a… ‘cause I had acne as a teenage, it was awful – it’s so wonderful when that goes away. Phil: They feed each other.